Even the homeless find ways of making themselves at home. The so-called encampments comprised of tents, sleeping bags, piles of clothes, plastic crates and lanterns are evidence of each individual’s need for refuge. Refuge is the title of Shinique Smith’s exhibition at the California African American Museum. 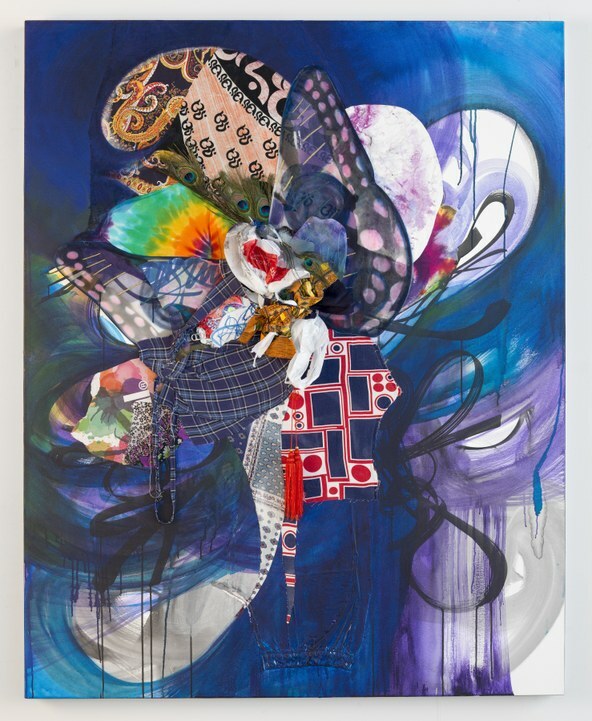 Refuge is the title of Shinique Smith’s exhibition at the California African American Museum, organized by independent curator Essence Harden. 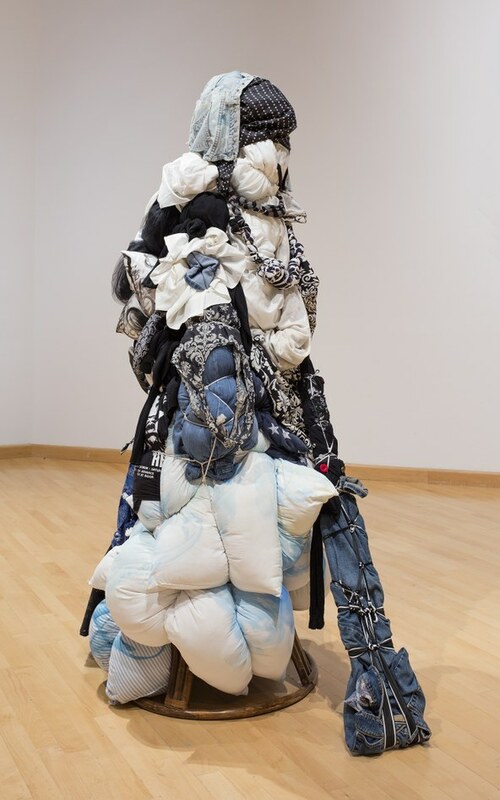 The artist uses scraps of fabrics and cast off clothes to make an art exhibition of poignant connections to conditions just a few blocks away from the museum. Shinique Smith.The Watcher (moon marked she walks in starlight), 2018. Clothing, fabric, pillows, ribbons, rope and found objects. Shinique Smith: Refuge at the California African American Museum. Courtesy the artist and David Castillo Gallery, Miami. Bale Variant No. 0021 (Christmas), 2011-2018 is the title of loosely stacked clothes, some in red or green, including a fuzzy Santa hat, tied together as a bale and surrounded by bricks wrapped in gift paper. Referencing, too, ancient totems or primary forms, the work embodies Smith’s strength in making challenging art with a heart. Shinique Smith. Sky Cloth, 2018. 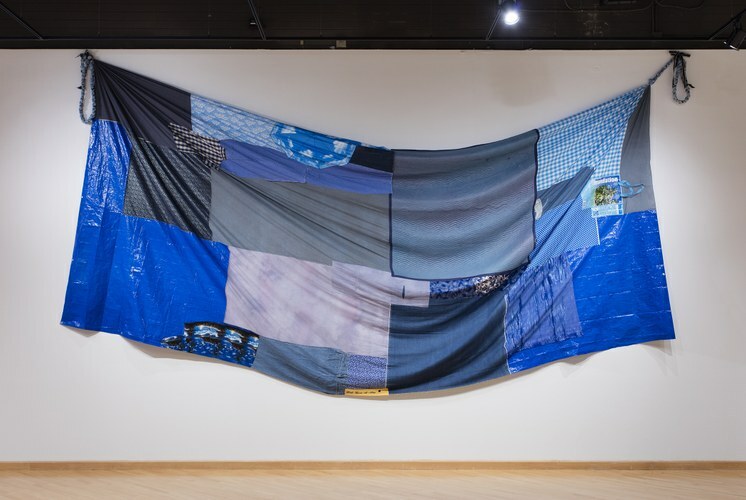 Clothing fabric tarp and blankets 11.5’ x 24.5’ Shinique Smith: Refuge at the California African American Museum. Photos by Brian Forrest and courtesy the artist and David Castillo Gallery, Miami. 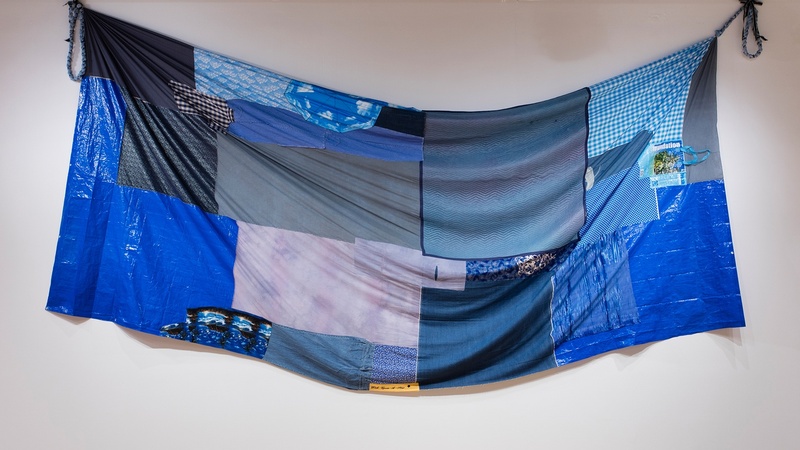 In another work, pieces of old denim and other blueish fabrics including some with images of clouds and the sun are sewn together and hung from the wall like a banner. A small yellow label at the bottom proclaims, “Wish upon a star.” Sky Cloth (2018), as it is called, embodies the fragile apparition of hope. 70 x 48 x 6 inches. Shinique Smith: Refuge at the California African American Museum. Photos by Brian Forrest and courtesy the artist and David Castillo Gallery, Miami. 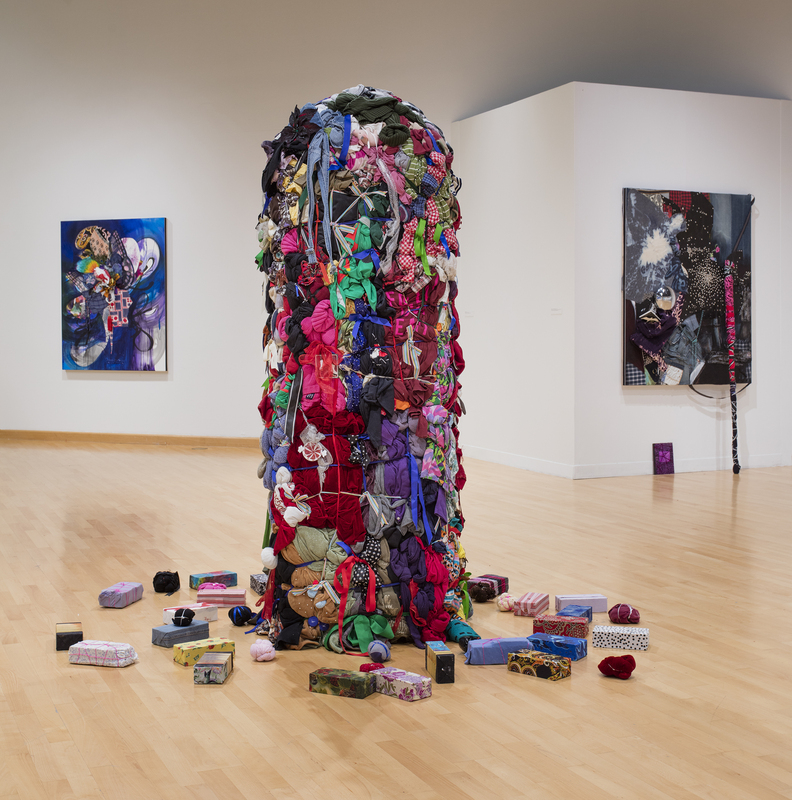 Smith uses the museum’s large undivided gallery as a place not for the observation of the special or precious but as a way of honoring the value, even the sanctity, of those trying to survive. Shinique Smith. Through native streets, 2011. Ink, acrylic, fabric, collage and objects on canvas over wood panel. 60 x 48 x 5 inches. Shinique Smith: Refuge at the California African American Museum.Courtesy the artist and David Castillo Gallery, Miami. One corner of the space features a triangular seating arrangement for Mitumba, an overstuffed and appealing deity. Plump cushions are arranged on the floor as easy seating. Last Saturday, half a dozen young people were resting there casually, either contemplating the art or looking at their I-phones. Around the corner is a narrow corridor where dozens of men’s shirts and pants are hung on a wall, there is a very small area for resting on a flowered mattress within a cardboard box. A child might fit. Shinique Smith. Bale Variant No 0021 (Holiday), 2011-18. Clothing, fabric, objects, wrapping paper, holiday gifts, ribbon and rope. 79 x 30 x 30 inches Shinique Smith: Refuge at the California African American Museum. Photos by Brian Forrest and courtesy the artist and David Castillo Gallery, Miami. Smith recalled hiding in such boxes as a child— I remember the same thing — feeling safe in the tight, dark space. This is her art but also a place to be used for comfort. Smith’s giant installation of hanging strips of fabric was a highlight of Hauser and Wirth’s debut exhibition Revolution in the Making. 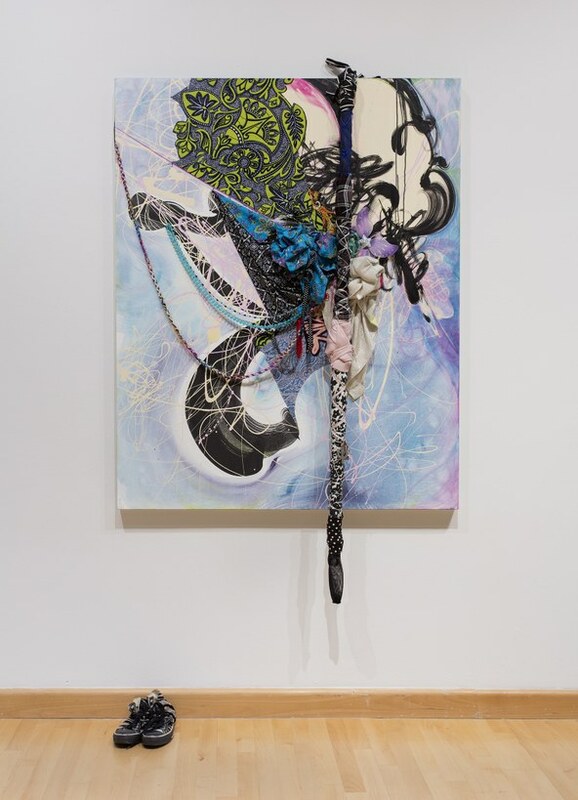 She has since relocated here from Brooklyn and though responding to a global problem with obvious manifestations in this city, her work never loses the potency of original visual expression, sculptural and painterly concerns. It is a mystery how any artist can make so much of so little but Smith does it with sensitivity and success. Smith’s exhibition includes a location for the donation of unusued blankets and household items for the homeless. There is also a box for donating cash, a welcome gesture since CAAM itself offers free admission. CAAM has undergone many changes for the better under new leadership and curator Naima Keith. The place looks sharper. Five of the lobby walls are painted with Fade to Black, a smart installation by Gary Simmons. Titles of now obscure early films with black actors are written in what appears to be white chalk smeared on a blackboard. The piece, on view through July 18, underscores the easily lost histories of the African American community. It also conveys a new seriousness and sophistication about contemporary art at the institution. Other shows on view include Nicole Miller’s video portraits made in the largely black neighborhood of Athens, outside of L.A.and the eye-opening and extremely enjoyable How Sweet the Sound: Gospel Music in Los Angeles, which is overflowing with facts about the city’s evolution and it’s relationship with a growing black population in the past century. 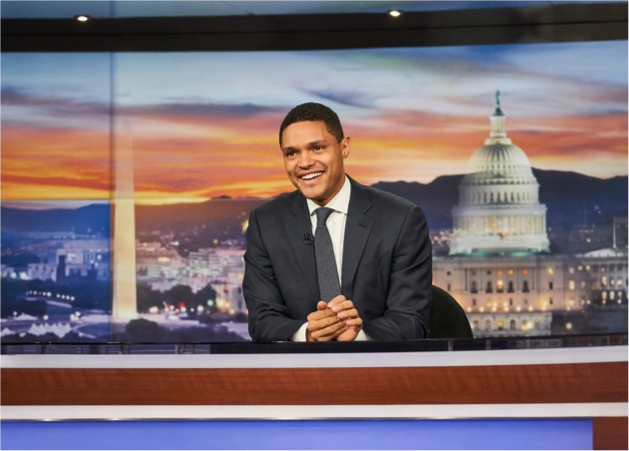 All shows continues through Sept. 9.